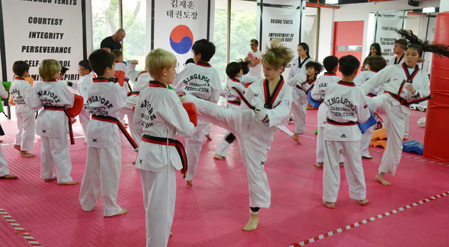 Affiliated to the Singapore Taekwondo Federation, J H Kim Taekwondo is one of the largest Taekwondo groups in Singapore. The Grandstand branch boasts the largest premises in Singapore and is led by Master Lai Han Seng who has personally won numerous coaching awards. His team of professional instructors includes champions and medalists in Kyorugi and Poomsae from diverse countries and cultures (i.e. Korea, China, Malaysia & Singapore) which helps to enrich the Taekwondo experience of students.